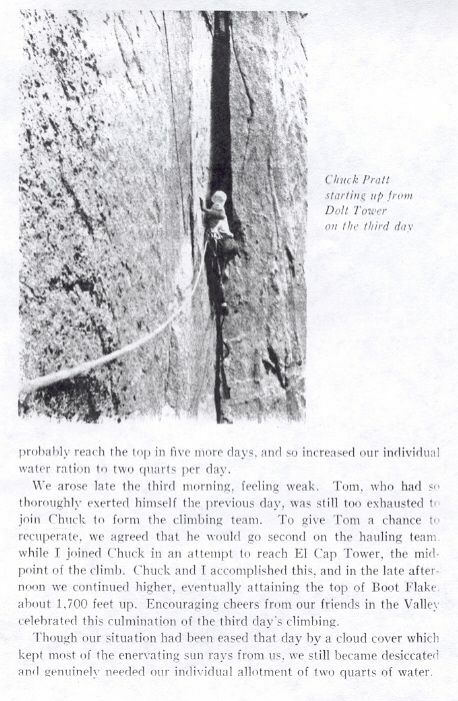 On September 13, 1960 Royal Robbins, Joe Fitschen, Chuck Pratt and Tom Frost completed the second ascent of the Nose of El Capitan in seven days of climbing. 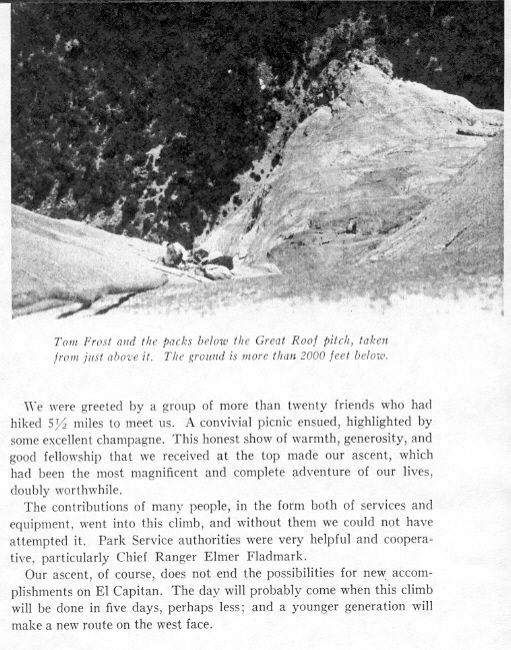 Royal reflected later that the experience was "the most magnificent and complete adventure of our lives." 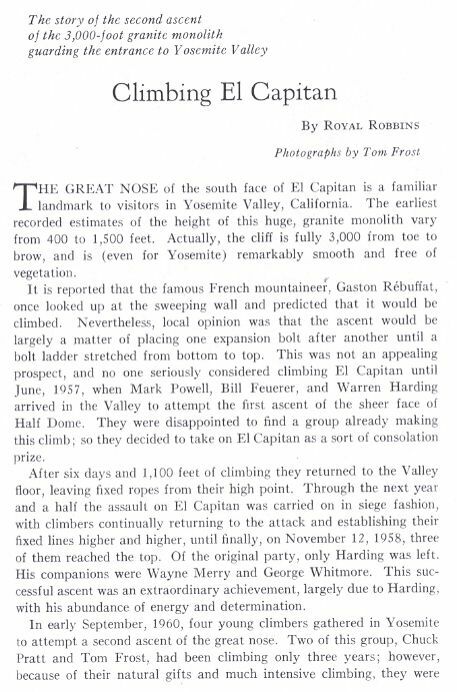 The first ascent of the Nose was a singular event with respect to the tactics, constraints and variety of players involved. 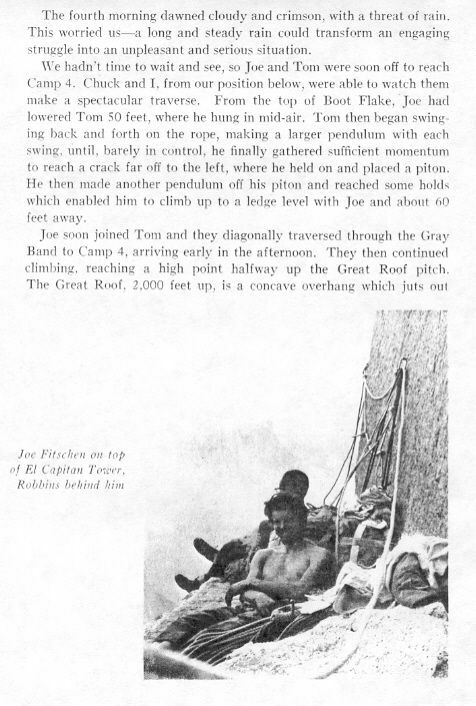 The prospect of repeating the route in a continuous push still held considerable unknown and the team prepared well. 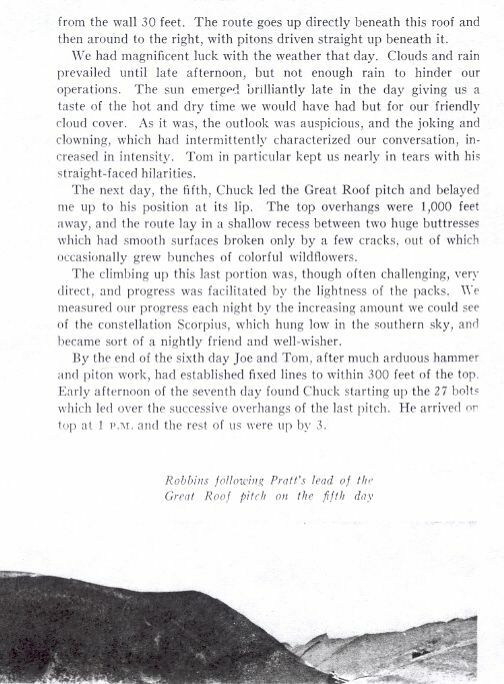 Royal promptly wrote an account of their grand adventure for the December, 1960 issue of the Sierra Club Bulletin. Some of the images suffer for the scanning and I will try to replace and add to them as this thread progresses. My working set of Frost images is out of my hands at the moment but as his work is everywhere, I'll do my best! Plans are in the works to gather in celebration for this 50th anniversary sometime in October. Tom, Joe and Royal are psyched up for the event by all accounts so this should be big fun. Tom got his start as a photographer during this climb when the Dolt showed him how to use his Leica and then loaned it to Tom! I think that Bill was deeply curious about the character of the beautiful upper dihedral that he never touched once Mark Powell injured his ankle and the Dolt spooked and split! What's with the eye patch? It seems I have seen shots taken during the same day and never once seen the eye patch! 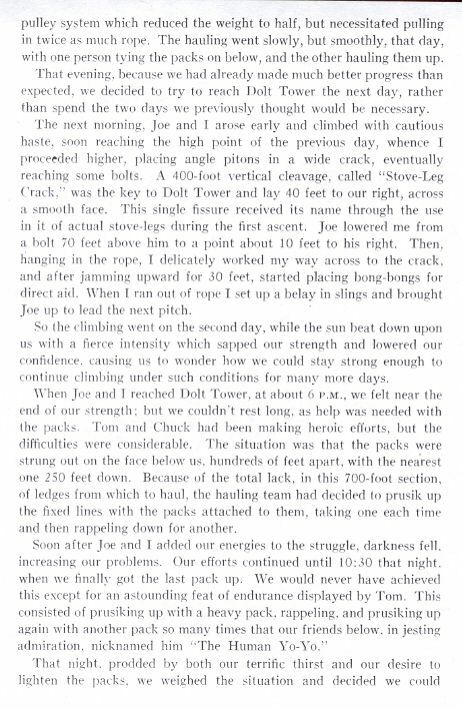 On October 23,there will be a presentation by Royal, Tom and Joe about this very climb. It will be at the East Auditorium in Yosemite Valley. Stay tuned. Very nice! 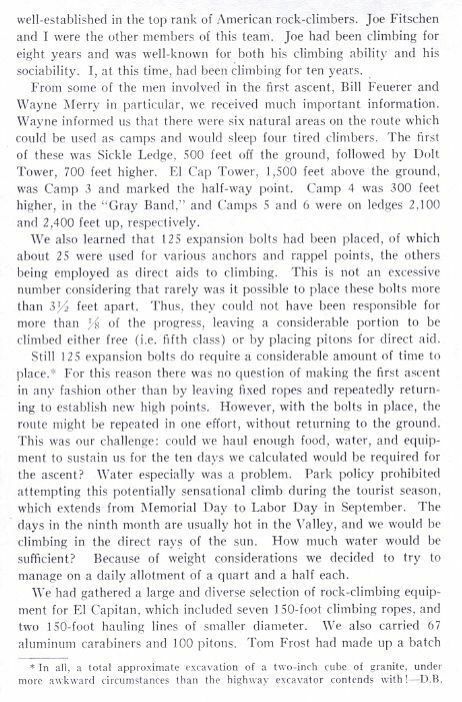 I wonder if the commemoration could be somehow part of the FaceLift, or if at least there could be a presentation about the climb one night? This should be a stand alone event even if it is promoted at the Facelift. That's the explanation...a hot chunk of chromoly. So much for the 'pirate' theory. What a great article, thanks Steve! White cotton balls just not quite sinister enough for a proper pirate! Though, if anyone from the Golden Age convincingly looked the part of a freebooter, that would have been Chuck. Harrrr! Shiver me belayer! 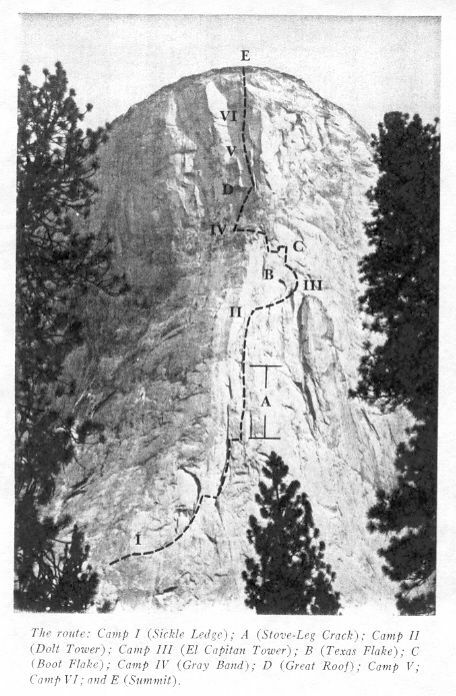 When is the anniversary of the third ascent? I'll post a good link when I find it again. There's no end of amazement courtesy of Guido and BBA. Late May of 63 in three and a half days! Smokin' fast! You coming to this one, Guido?!? 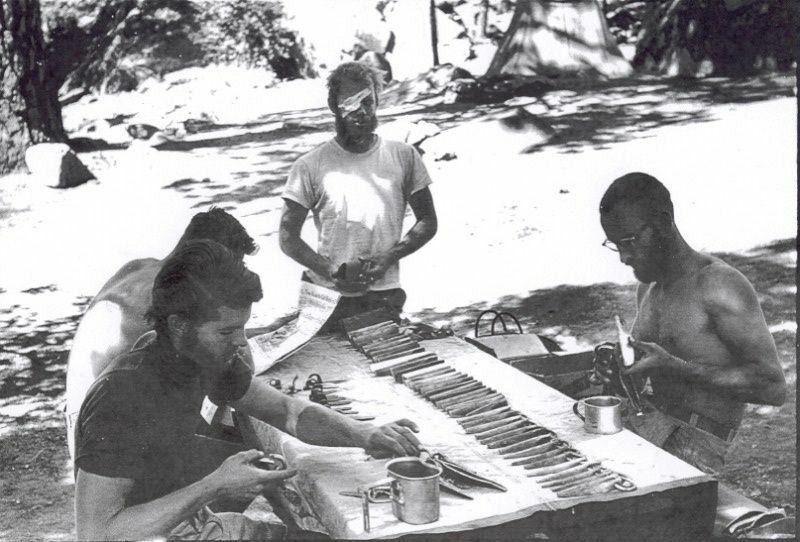 However, I'm planning to be in N. CA during the last 2 weeks of August, and want to make a pilgrammage to Yosemite/Tuolume, hopefully with or meet Guido, Lauria, Hennek, McLean, Cohen, Dozier, and others from that era who may be in the area then. Please let me know if you'll be around. Wow! Just a couple months before I was born, and I thought I was old! 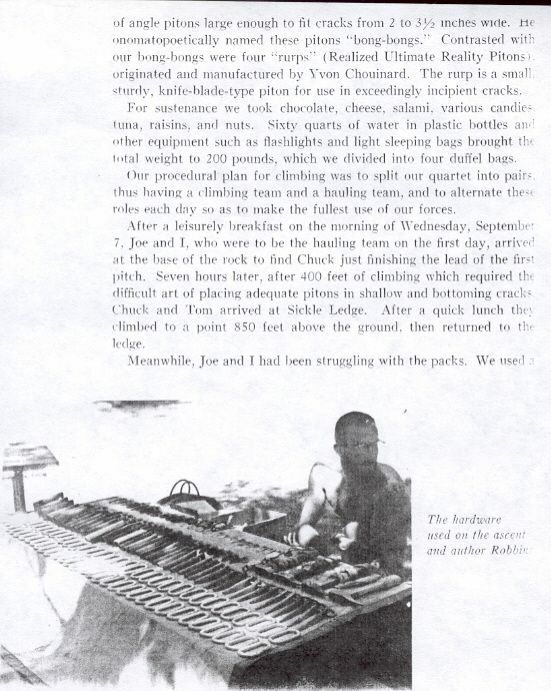 God bless these pioneers of the vertical...Such awesome risks assumed as well for these men! !